I have been trying to propagate Lady Di Panorea from 2 very healthy vigorous plants. Am using the little propagating greenhouses to maintain moisture. (see photos). Also using peatmoss cups as containers, propagating soil and Yates Plant Cutting Powder. Am following directions for the cuttings. I do mist the cuttings twice a day to keep the moisture high. They are not in direct sun, but if I set them in direct sun they seem to dry out extremely fast or can seem to "cook". 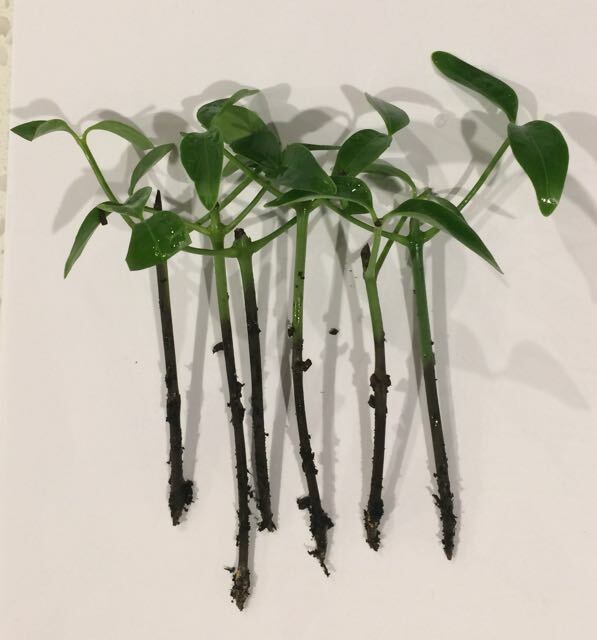 Overall cuttings seem to be fine for about 7 days and then the stems begin to turn black from below the soil up. If left the entire cutting goes black. I am on my 5th round of cuttings. Have tried younger stems, more older wood cuttings. Cutting at the node, not cutting at the node, root powder with honey, root powder only. All seem to end up the same way. It is a fast-growing, successful climber so not sure why it is so sensitive to propagate. As another try I have started a new round of cuttings using 50% sand and 50% propagating soil in the container. I've attached some pics of the set up and of the cuttings. Can I get your advice on what may be causing this to happen? Or is this normal and I should just leave them be? Any advice or guidance is much appreciated. Thank you for the links PlanB! Yes, they are lovely plant that doesn't need much maintenance! I found them really easy to grow from seeds. I collected some seed pods from a vine growing along a fence at a pub we visited for lunch one day. I just chucked the seeds into a pot and when they sprouted to a reasonable size I transferred some of them to three large raised planters I have around the outdoor area. I now have three different coloured flowering vines. One flower is white with a yellow throat, another is white with a purple throat, and one is all pink. The initial vine I pinched the seeds from was all pink, at least as far as I could see, go figure. That's interesting PlanB. I wondered why ACTgardens was persevering with cuttings when seeds are so readily available. Mine grew like weeds lol. Incidentally, I had a closer look at my vines yesterday, they are intertwined, but I assumed that there were three different vines producing the different flowers, but that's not the case, at least one vine has two entirely different coloured flowers blooming at the same time. I suspect that might be the case with all the vines (like I said they are growing like weeds) but this one was obvious because the flowers are pretty much side by side on the same stem. Thank you for the additional comments. You mentioned that seeds are readily available. Other than the ones you collected from a fenceline, can I ask where else they may be available? I haven't been able to find any online or in stores / nurseries. We are in ACT. Any tips for a source or direction would be appreciated. Sorry ACT Gardens. I'm in Queensland so can't really help with hints on accessing seeds. I just assumed that because you were using clippings that you had access to a vine. Hi Leonie! Thank you for the advice. I appreciate it. I think that may be the way I need to go. Go to Yates website and they have heaps of information and you can ask questions as well. Or even the ABC gardening website. Thanks for the reply musicveg! I have replicated this same post on the yates forum. Have yet to hear back from anyone. Will look into the ABC gardening site. Thanks again. Thank you for the reply Plan B. I am the owner of 3 pandorea plants. That's how I have been trying to propagate the cuttings. I have yet to notice them seed yet though. Will keep a closer eye on them when spring returns next year. ACT, sorry I answered your post in the wrong way -- I had forgotten it was you that put up the original post -- my mistake, sorry.